The introduction of calcineurin inhibitors (CNIs) and mycophenolic acid (MPA) to the transplantation clinic improved the outcomes of kidney transplantation. Therapeutic drug monitoring of these immunosuppressive drugs is currently based on a pharmacokinetic approach that measures whole-blood (pre-dose) drug concentrations. Unfortunately, these measurements cannot accurately predict clinical outcomes after kidney transplantation, such as rejection, and have a poor correlation with long-term outcomes after transplantation. Pharmacodynamic monitoring is an alternative and possibly complimentary way for therapeutic drug monitoring that measures the biological effects of the drug at its target site. 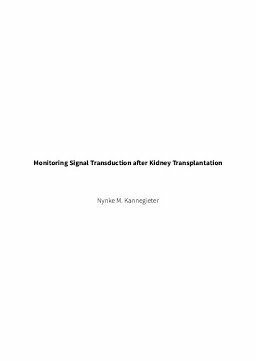 The research described in this thesis assessed novel techniques for pharmacodynamic monitoring of immunosuppressive therapy after kidney transplantation. Two promising methods are the phospho-specific flow cytometry assay and the intracellular monitoring of NFATc1 amplification. Phospho-specific flow cytometry measures the phosphorylation of signaling molecules involved in T cell activation, such as p-p38MAPK and p-ERK and p-Akt. The assay can be applied to monitor therapeutic drug effects on both T cells and monocytes. The phospho-specific flow cytometry assay also revealed that the currently prescribed immunosuppressive drugs have only a limited effect on intracellular monocyte activation pathways, demonstrating the need for new drugs that target monocytes after kidney transplantation. Another promising method for PD monitoring of tacrolimus in T cells is the analysis of NFATc1 amplification. Measuring NFATc1 amplification is a specific whole-blood test to monitor the biological effects of tacrolimus in T cells of kidney transplant recipients. Both the phospho-specific flow cytometry assay and the NFATc1 amplification assay can measure the activation of signaling molecules in different T cell subsets. In the future, when both assays are ready for routine use we recommend that these assays should be used in combination with pharmacokinetic measurements.